• OFFSET ANGLE BETWEEN ANGULAR MOMENTUM VECTOR AND ORBIT NORMAL. 1 NUTATION HALFTONE ANGLE. T>> - ARCTAN ([<lx"xl2 ♦ «2"Z)J] '"/'^„Sl), WHERE lx. Iz. AND ARE THE X. Z. AND WHEEL INERTIAS: u>x AND Uy THE BODY RATES IDEG/S): AND S. THE WHEEL SPEED IRPMI. Fig. 19-16. Deadbeat Maneuver tor Removal of Pitch Libration Using Extendable Boom. The origin of the figure corresponds to pitch »pitch rate 0, but the scale of the axes is arbitrary. Note that pitch=0 implies an inertial rate about the pitch axis of minus 1 revolution pet orbit (rpo) or 1 rpo almut the positive orbit normal. •We assume that the inertia change is instantaneous. 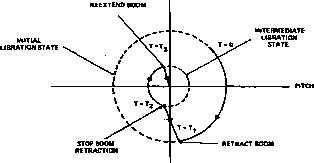 For typical configurations, boom maneuvers require I to 10 minutes whereas libration periods are typically 1 hour («orbital period/V3 ). The external torques are proportional to pitch (and near zero) when the extension and retraction occur. which is the required moment of inertia after retraction to remove a libration rate amplitude />,. where A, the maximum value of pitch, is an integration constant. Magnetic Stabilization. As a final acquisition maneuver type, magnetic stabilization is a technique in which a spacecraft axis is induced to track the Earth's magnetic field about the orbit. This is used for high inclination spacecraft to provide a reference angular momentum direction normal to the orbit plane. Consider a spacecraft in a polar orbit with an electromagnet along the yaw axis and an onboard damper. Regardless of the initial attitude and attitude rate, the interaction of the electromagnet and external field will cause the yaw axis to track the field (minimum energy configuration) and induce an average spin rate of 2 rpo about the orbit normal. Magnetic stabilization was used for GEOS-2 and proposed for GEOS-3 as the first step in the attitude acquisition because it is passive (no ground support is required) and converts a random initial state into a well-defined state suitable for subsequent acquisition maneuvers. In this section, we describe the attitude acquisition sequence employed for the Geodynamics Experimental Ocean Satellite, GEOS-3, launched on April 9, 1975, from Vandenberg Air Force Base, California, on a Delta 1410 rocket. Other acquisition sequences are described by Basset  for CTS, Byrne, et al.,  for HCMM, and Markley  for SMM. GEOS-3 demonstrated the utility of spaceborne radar altimeters for oceanography and served as a bridge between the earlier geodetic satellites, GEOS-I and GEOS-2, and the ocean resources program, SEASAT. The spacecraft, illustrated in Fig. 19-17, was placed in a circular orbit at an altitude of 843 km and an inclination of 115 deg to provide coverage of the North Atlantic Ocean, the area of primary experimental interest. The ground-based, open loop attitude acquisition sequence Tor GEOS-3 was designed to achieve a gravity-gradient stabilized, three-axis attitude with the spacecraft z and y axes in the nadir and negative orbit normal directions, respectively. 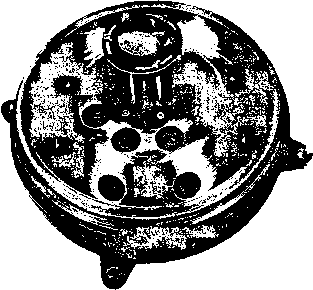 The GEOS-3 control hardware consisted of a 6.5-m boom extendable along the negative z axis; a passive, magnetically anchored eddy current damper (Section 18.4) located at the end of the boom; a z axis electromagnet; and a momentum wheel with its axis along the y axis. Attitude determination hardware consisted of two-axis digital Sun sensors and magnetometers. Pitch and roll stability in the mission mode was provided by gravity-gradient torque and yaw stability was accomplished via quarter-orbit coupling with roll through the momentum wheel (see Section 18.2).